Unclaimed Baggage - Bargain or Bust? 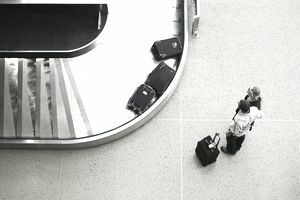 Many of us have experienced that sick feeling of waiting by the luggage carousels at airports hoping that somehow our lost luggage might miraculously appear. Sometimes it does, but many times it ends up in another airport and is classified as "unclaimed." The airlines try for 90 days to match the lost luggage to the rightful owners, but when all efforts have failed, passengers will make their claim, and the airlines will pay. But what about the luggage? It probably did not fall out of the plane, so it has to be somewhere, right? Chances are the contents of lost luggage will end up in Scottsboro, Alabama, at the Unclaimed Baggage Center, a company that has set up a retail store to sell anything deemed sellable from all the contents inside of the lost airline luggage that never made it back to the owners. The 40,000-square-foot store stays full all year-round, thanks to the merchandise coming in by the truckload. On an annual basis, Unclaimed Baggage deals with around one million items. The items that the store receives range from boringly normal to utterly strange and exotic. The store has seen unique items, including a 19th-Century full suit of armor and a mummified falcon, company spokesman Brenda Cantrell told the Denver Chronicle. She also mentioned items like a camera from one of NASA's space shuttles (returned to NASA), a 40-caret emerald ring and a live rattlesnake. The company purchases all items sight-unseen. The merchandise is trucked in, sorted and priced at typical thrift store prices and then placed on the sales floor. Inappropriate items or merchandise that is in bad shape gets tossed or donated. Items that are unique might find a home in the store's museum, which displays the store's most unusual finds. To keep up with all of the work, the Unclaimed Baggage Center keeps around 140 employees on hand. Shoppers should try to be at the Unclaimed Baggage Center at around 2:30 p.m., which is when each day a customer is chosen to open a piece of luggage for the first time and unpack any hidden treasures that lay inside. The Quality of Goods and Prices -- Worth the Trip? The Unclaimed Baggage Center received publicity in recent years and as a result, there has been a lot of feedback from shoppers regarding their shopping experiences. For bargain hunters who enjoy digging through a lot of merchandise in hopes of finding a great deal, UBC fits the bill. However, the quality of the goods and the merchandise levels can be unpredictable. Shoppers should be prepared to leave empty- handed. Prices are not dirt cheap. Clothing, which is dry cleaned on-site, runs an average of 50 percent off retail. There is usually an abundance of laptops, iPads, cell phones, earbuds and earphones. Looking for a new guitar? Chances are you will find some to browse. Golf clubs, skis and snowboards take up a significant amount of the store's selling space, so outdoor enthusiasts may want to check it out. That's not bad if the merchandise is in good shape, but since most of it is used, it needs to be carefully inspected before buying. The store contains separate sections for electronics, formalwear and jewelry — including wedding rings and Rolex watches worth $60,000. Other potentially desirable items include sporting goods, and then there are those things that only vacation travelers would pack, such as straw hats. Google reviewer Tisha Young gave UBC three stars and said, "If you have the time to spend going through all the racks of overpriced stuff in order to find the few deals hiding there then you'll like this place. Tons of stuff available but much is pricey due to excellent condition and designer brands. You might luck up on something or you might not. If nothing else, it's a way to pass the time." The store is located in Scottsboro, Alabama. For more details, visit the Unclaimed Baggage website.